Suffering from “holiday withdrawal” now that Halloween, Thanksgiving, Christmas, and New Year’s Eve are behind you? Cheer up and cure those withdrawal symptoms with tea! This endeavor should not be as laborious as it may sound at first. No need to trudge hither and yon and brave throngs of shoppers wielding pepper spray or grabbing madly at the bargains available. 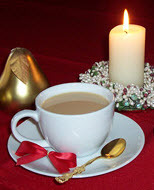 In fact, this tea event should be a holiday from all that holiday falderal! Besides, you probably miss the pretty decorations, sparkle and shine, and candles glowing in their romantic fashion. Go ahead, ’fess up! I sure do. Let’s see… where’s that special “Tea Princess” teapot that Santa left under the tree… and some Christmas cake (you always buy an extra one for such occasions, right? )… and then a nice big pot of Darjeeling tea or maybe some Yunnan Gold or even Earl Grey. There, you’ve just extended the holiday season for a little while longer and with practically no effort. You should feel those withdrawal symptoms subsiding. Put on a Christmas CD by Mannheim Steamroller to make things complete! Tea Moments — The Chef Knows Best? Glad you liked it, Rayford, and best wishes with your task tomorrow. Thanks for reading! I was just pondering, over my teacup, the “let down” from putting Christmas “away” for another year….thanks for the tips on keeping the cheer in the New Year!